Born a Kiowa in Lawton, Oklahoma, Navarro Scott Momaday received some months later the Indian name Tsoai-talee (Rock Tree Boy), derived from the Kiowa word for a sacred rock tower in Wyoming (called Devil’s Tower by non-Indians.) Sixty years later, Edward Abbey would remark that the name Tsoai-talee seemed well justified. Momaday’s mother, Mayne Natachee Scott, wrote children’s books, and his father, Alfred Morris Momaday, was a painter. They moved when their son was a toddler to the American Southwest and took teaching posts with the Bureau of Indian Affairs. Together, the couple composed the entire teaching staff of the Jemez Pueblo School in New Mexico for 25 years. “From the age of 12 to 17, I lived on the back of a horse, exploring every corner of that beloved world,” Momaday says, noting with a wry smile that he and Alexander the Great were both given horses at age 12. The landscape as sustainer frames House Made of Dawn, an international classic and Momaday’s first book. It won a Pulitzer Prize in 1969 and helped Native American literature breakthrough to the mainstream. From childhood, Momaday moved back and forth between Indian and non-Indian settings, completing his senior year of high school at a military academy in Virginia. He took an undergraduate degree from the University of New Mexico, then won the only poetry fellowship granted his year in the creative writing program at Stanford University. He earned his doctorate in English literature there in 1963 and began his life as a scholar. In 1969, Momaday was initiated into the Gourd Dance Society, an ancient Kiowa ceremonial fellowship, and he has attended its annual gatherings each subsequent year. Other honors accrued, including positions on the faculties of the University of California, Stanford and the University of Arizona. 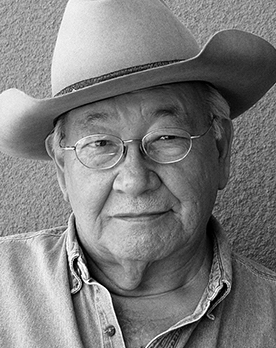 In 1974, Momaday became the first professor to teach American literature at the Moscow State University in Russia. In 2007, President George W. Bush awarded Momaday a National Medal of Arts. The writer splits his time between Oklahoma City, where he served as the Centennial Poet Laureate, and Santa Fe, where he worked as a senior scholar for the Center for Advanced Research.